to developers at Google I/O at the end of May. We wanted to celebrate this launch with Aussie developers and kickstart a thriving local Wave community, so we held an all day hackathon in the office last Friday. 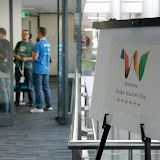 About 80 developers attended the event, representing media companies like Fairfax and Telstra, nearby universities like UNSW and UTS, open-source projects like Jetty, and everything in between. After a day of talks, brainstorming lunches and a good five hours of hacking, 25 developers (or teams, as many came with their colleagues or made new friends) were ready to show off their demos. The most common types of demos were games - Hangman, Connect 4, Boxes, Competitive Tetris, Werewolf, Zork, "World's Simplest Game", "World's 2nd Simplest Game" - and search - cheap flights, Flickr, OZ TV listings, tours, definitions, acronyms. Several developers experimented with the mobile platform, with two gadgets performing geolocation on the iPhone (one using the browser's geolocation property, the other using the native app capabilities), and a robot proxying Wave requests on the Android. We also saw a few moderating bots (thinking about swearing on Wave? think again!) and a bot that kindly agrees with everything you say (even if you swear!). The crowd favourites, voted on at the end, were Napkin Gadget - a collaborative Flash app for doodling, Syntaxy - a robot that adds syntax highlighting to Python code, and Pong - a gadget demonstrating low latency lag between clients. The Sydney-based Google team proudly previewed Google Wave to developers at Google I/O at the end of May. We wanted to celebrate this launch with Aussie developers and kickstart a thriving local Wave community, so we held an all day hackathon in the office last Friday. About 80 developers attended the event, representing media companies like Fairfax and Telstra, nearby universities like UNSW and UTS, open-source projects like Jetty, and everything in between. After a day of talks, brainstorming lunches and a good five hours of hacking, 25 developers (or teams, as many came with their colleagues or made new friends) were ready to show off their demos. Or when I want to find out why that patch of skin on the back of my left thigh has become a little rough. And other times I delve into the more complex, like how to change the bulb for my bedroom light. You’ve never made me feel annoying, or told me to ‘just go away!’. Provided visual stimulation for significant events, taught me how to self-examine my own breasts. My love for you is undeniable, your existence in my life undoubtedly vital.
. Here you can find short videos explaining the benefits of the new interface, a before and after guide, and even a short quiz you can take to make sure you're ready for the changes. Next, if you haven't explored the new interface yet, now is a good time; try it by signing in to your AdWords account. If you notice any issues that make it difficult to manage your campaigns in the new interface, please let us know right away by submitting feedback. If you've already sent us feedback on the new interface, thank you! We're listening closely to your comments and are working to fix the problems you've reported. Examples of top issues we're working on are wide pages that require too much scrolling, and slow load times for some types of browsers and Internet connections. We've already made a number of changes in response to your feedback, and this week we've released updates to the new interface that address many of the top issues we've heard. And we're not done yet; we'll continue to make ongoing improvements to the new interface over time. For those of you who joined the beta test early, we hope you like how the new AdWords interface has improved. And for those of you just getting started, we hope you're already noticing a few of the ways the new interface can help you get more out of your AdWords campaigns. By now you probably know that we've been working on a new interface for AdWords to help you save time managing your account and get even better results from your campaigns. We've built a number of new features that make managing your campaigns faster and easier: more graphs to track your performance over time, integrated reports that provide ready access to detailed search and content network data, and faster editing to help you make changes quickly. You've probably received an email from us letting you know that your account will be converted to the new interface in the coming weeks. Today we have two release updates to share with you: we've recently made the new interface available to everyone who uses AdWords Standard Edition, and we've begun the migration process with a small number of accounts. In our email, we stated that you would have at least 30 days before we update your account. This 30 day period is a minimum; in fact, most advertisers will have more than 30 days before their accounts are upgraded. We're taking a gradual and deliberate approach to ensure a smooth transition, and we won't upgrade your account until we're confident that the new interface meets your advertising needs. So, how should you prepare for the transition to the new interface? First, the single most important resource to help you get up to speed is the new interface microsite. Here you can find short videos explaining the benefits of the new interface, a before and after guide, and even a short quiz you can take to make sure you're ready for the changes. Once again, this year we're proud to partner with the Australian Government for National E-security Awareness Week, between 5–12 June 2009. We share a commitment to helping you secure yourself and your information on the internet. The week is designed to raise awareness of the steps that you can take to keep yourself and your family secure online. If you do nothing else all week, stop for a moment to come up with a better, stronger password for your personal online accounts and transactions. In conjunction with Stop Badware.org, we place warnings in our search results for websites that our testing has determined to host or distribute badware. If you search for a site that Google has determined to be potentially dangerous, you will see a warning in the search results. Earlier this year we launched the Australian Safety Centre on YouTube, containing straightforward online safety tips and resources from experts and prominent Australian safety organisations including Bravehearts, Reach Out, Kids Helpline, NetAlert.gov.au and Cybersmart Kids Online. We offer all Australians a free collection of software (Google Pack), which contains Norton Security Scan and Spyware Doctor Starter Edition, to detect and remove viruses, worms, spyware, adware, trojans and keyloggers. As the flu season kicks off in the southern hemisphere, we're announcing the launch of Google Flu Trends for Australia and New Zealand. Google Flu Trends, which launched in the US last year, resulted from our observation that certain flu-related search queries are common during flu season, and that searches for flu-related topics are closely correlated to the actual spread of flu. If we tally each day's flu-related search queries, we can estimate how many people have a flu-like illness. While some traditional flu tracking systems may take days or weeks to collect and release data, Google search queries can be counted immediately. As a result, Google Flu Trends can be updated daily and may provide early detection of flu outbreaks. To create Google Flu Trends for Australia, we worked with historical seasonal flu data from the Victorian Infectious Diseases Reference Laboratory (VIDRL), as well as our own anonymised, aggregated historical search data, to build a flu model for the state of Victoria. We then extrapolated this model to produce flu models at a national and state level for the rest of Australia, apart from Tasmania and Northern Territory for which we don't have a large enough volume of search queries to be accurate. Upon building this model, we found that our historical Google search data correlated well with the VIDRL's historical data in terms of flu activity in past years. As the season unfolds this year, we'll be watching to see how well our flu model performs compared with these existing surveillance systems. Influenza is thought to generate hundreds of thousands of GP visits in Australia every year, and thousands of serious illnesses and sometimes even deaths. Early detection is critical to helping health officials respond more quickly and save lives. As part of our diversity K-12 initiative we invited students and teachers from top performing high schools in the areas of computer science, ICT & software design in Sydney to participate in a morning of product demos and algorithm design interactive sessions. We gave them a true taste of what it's like to work in technology. And these girls rocked! They shared their views on computer science and the Internet with Googlers and each other, and asked very savvy questions around what it's like to work at Google, how studying ICT can open many new avenues of opportunity that were previously unavailable, and demystifying the idea that ICT is just for boys. The morning was aimed at supporting high school girls in ICT disciplines and to encourage them to continue with these areas of study through HSC and beyond. With so many girls in attendance it was a great chance for them to network, share their ideas on computer science, and get to know a little bit more about what it's like to work in the industry. We hope we've left them with lasting inspiration and passion for computer science, and we look forward to seeing them back at Google again soon. Who said computer science is for boys? Not the 90 girls from six schools who descended on the Google office in Sydney today for our very first Girls @ Google Day. , Google's personalised homepage, lets you create customised pages with snippets of information including games, news, and video (these snippets are known as “gadgets”) from across the web, without having to bring up each site individually. It brings you immediate, at-a-glance access to the information you search for regularly across the web, on a single page. Australian child care search engine CareforKids.com.au has also created a gadget that makes it easy to search for child care vacancies and find information on child care providers near you, including fees, testimonials and maps. According to a recent survey conducted by CareforKids.com.au, nearly one in five parents take more than a year to find appropriate child care, so this gadget should help make the search a lot easier and provide vital additional information to parents all over Australia. We've also made some other changes to the iGoogle interface, like replacing the tabs with left-side navigation, so you can jump from one canvas view to another with just one click. There are around 60,000 gadgets and 200,000 feeds available in our public directory for people to add to their iGoogle page, and more than 2,000 iGoogle themes currently available, including themes designed by Australian artists. So what are you waiting for? Get started with iGoogle and set up your own personalised homepage today. iGoogle, Google's personalised homepage, lets you create customised pages with snippets of information including games, news, and video (these snippets are known as “gadgets”) from across the web, without having to bring up each site individually. It brings you immediate, at-a-glance access to the information you search for regularly across the web, on a single page. It was a big day for us here at Google Australia - the Governor-General, Ms Quentin Bryce AC, officially opened our new Google Australia headquarters at a ceremony in Sydney. Around 350 Aussie Googlers will be based in the 6-Star Green Star-designed Workplace6 building in Pyrmont. Our new office contains a number of Australian-themed areas, including offices with picnic benches, fish tanks, Australian flora, the beach-themed "Cafe Esky" and a games room named "The Rissole". It's in an architectural style that can best be described as "Googley". The new headquarters represent a milestone in the history of Google in Australia, which started with a single employee selling Google AdWords from her lounge! So we marked the occasion by announcing some new services in conjunction with local organisations ... we're working with Fairfax Media to digitise archival copies of newspapers, including the Sydney Morning Herald and The Age, dating back to the late 1800s and early 1900s. This means that Australians can now get free access to Australia's rich journalistic heritage through Google News and Google Search. We also announced that public transit information for Sydney's light rail and monorail network (Metro Transport)and Canberra's bus network (ACTION buses) will be available in Google Maps later in June. Users of Google Maps in these areas will be able to easily access public transport schedules, routes, and plan trips using local public transport options. We've put together a video showing our move to the new office and some of the hard work that went into setting it up ... plus a very special finishing touch that we asked the Governor-General to sign to officially declare our office open. Enjoy!